Today we bring you one of the smaller models we took to The Great Western Brick Show. Nine Men's Morris is a strategy board game for two players dating at least to the Roman Empire. 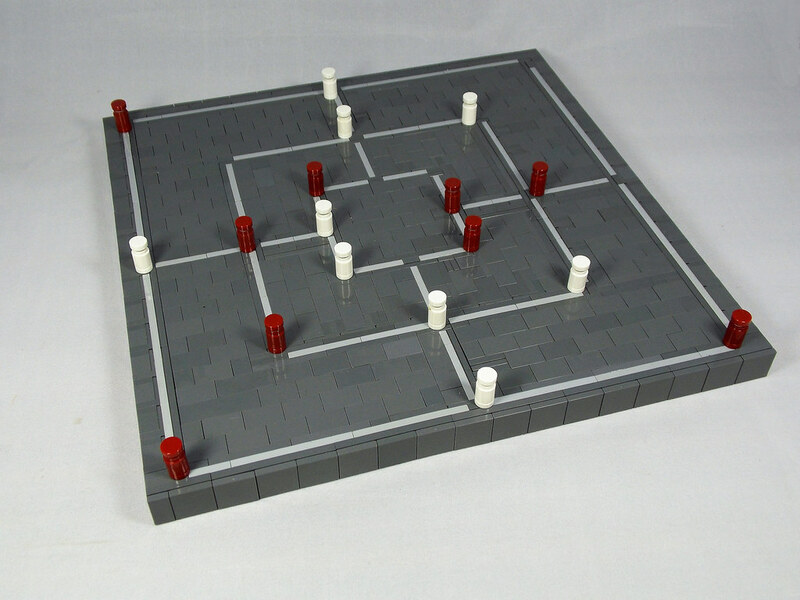 The model was created by Simon Pickard as part of a series of historic games he's working on to compliment the various themes chosen by Brick to the Past each year. Simon has used some clever tricks to build this board. For example, there is extensive use of the Studs Not On Top technique (commonly known as SNOT), which is often difficult to get right owing to the differing geometry of Lego pieces. Here the technique has been employed masterfully, so much so that it is difficult see where the joins and connections are actually made. Tying this to 2016's England 793 project is the fact that Nine Men's Morris has been found at a number Viking and Anglo-Saxon sites including the famous Gokstad Viking Ship, currently housed in the Viking Ship Museum in Oslo, Norway. Nine Men's Morris is a solved game in which either player can force the game into a draw; as for the rules, Wikipedia is your friend. Apologies for the lazyness, but we didn't want to copy and paste lots of text from another website. Finally, it's worth saying that we don't know what the rules of Viking or Anglo-Saxon Nine Men's Morris were, there are even indications that a die may have been used. Our version is the modern version, but it's still one with ancient roots.